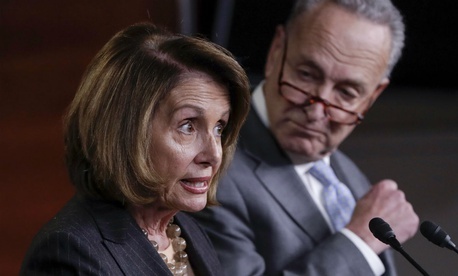 Negotiations between President Trump and congressional Democrats over funding the government past Dec. 8 broke down before they even began on Tuesday, with leaders of the minority party backing out of a meeting at the White House that they said was just for show. A current stopgap measure to fund agencies is set to expire Dec. 8. Hours after the tweet, Schumer and Pelosi issued a joint statement saying they were no longer attending the scheduled meeting. Talking with Trump, they said, would be a waste of their time. Schumer and Pelosi noted they have been working with Republicans consistently to avoid a shutdown and will continue those talks. The last time congressional leadership met with Trump at the White House, Democrats emerged having struck a deal with the president. Republicans were caught off guard by the agreement, which included the current continuing resolution, a debt ceiling increase and emergency spending for disaster relief. In a joint statement of their own, Ryan and McConnell suggested their Democratic counterparts have elevated the odds of a shutdown by finding “new excuses not to meet with the administration” to discuss outstanding issues. “Democrats are putting government operations, particularly resources for our men and women on the battlefield, at great risk by pulling these antics,” they said. “There is a meeting at the White House this afternoon, and if Democrats want to reach an agreement, they will be there." For its part, the White House said Trump and administration officials would proceed as scheduled with the meeting regardless of whether Democrats attend. “It’s disappointing that Sen. Schumer and Leader Pelosi are refusing to come to the table and discuss urgent issues," White House Press Secretary Sarah Sanders said. “The president’s invitation to the Democrat leaders still stands and he encourages them to put aside their pettiness, stop the political grandstanding, show up and get to work." If Republicans agree to continue to negotiate with Democrats without Trump present, they will have many issues to sort out. As part of the forthcoming negotiations, Congress must reach an agreement to raise the 2011 Budget Control Act spending caps or risk a sequestration. Lawmakers are reportedly currently working on a two-year budget deal to increase spending levels by as much as $200 billion. Congress struck similar agreements in both 2013 and 2015. Democrats have insisted that any such deal must raise spending equally for defense and non-defense agencies. Current caps restrict spending to $549 billion for defense and $516 billion for non-defense agencies. Even a continuing resolution for the remainder of fiscal 2018 would exceed those caps, according to the Congressional Budget Office. Other yet-to-be resolved issues, such as health insurance cost sharing, Trump’s proposed wall along the U.S.-Mexico border and the status of certain undocumented immigrants, could also upend negotiations as a shutdown draws closer.